Bob Beckwith, a retired New York City firefighter, is one of the best-known faces of the rescue efforts in the aftermath of Sept. 11, 2001. 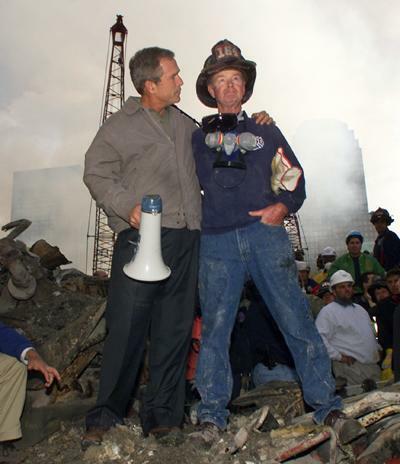 The photo of him wearing his old fire helmet, standing alongside then President George W. Bush atop the ash-covered remains of a fire truck, became legendary. It graced the cover of the next day's New York Post and, later, Time magazine. It also catapulted the retiree into the nation's spotlight. Beckwith, 79, still lives in the same house in Baldwin, Long Island, that he has shared with his wife, Barbara, 77, since 1958. "I was just an old man, just getting older and enjoying my retirement. Then 9/11 came," he says. On that grave morning 10 years ago, he had already encountered one terrifying shock: His 14-year-old grandson was hit by a car while he was biking to school. Beckwith rushed to the scene, fought his way through a crowd, and waited at the boy's side for the ambulance to arrive. A short time later, he stopped home on his way to the hospital, heard the news on the radio about what was happening at the World Trade Center, and turned on the television. "I heard a small plane went into the tower," he says. "I'm looking at this and the smoke on the upper floors, and then the wind took the smoke. I said, 'Well, that's a bit bigger than a small plane.' ... I couldn't understand what was happening." Less than an hour later, he was in the emergency room in nearby Mineola, glued with others to the TV. That's where the former firefighter, who had been retired for seven years, watched the south tower collapse. From that hospital, where it appeared his grandson was going to be OK, he knew where he needed to go next. At first, his six adult children -- and his wife -- refused to let him go. By Sept. 13, his fierce will had won over their protests. A former union leader of his, Jimmy Boyle, had not yet heard from his son, Michael, 37, who was also a firefighter and had not yet been found in the rubble of the toppled buildings..
"When I [found] out that his son was missing, I said, 'That's it, I'm outta here,'" Beckwith says. Dressed in some old FDNY gear, he managed to bluff his way past the blockades and barricades into the wreckage area, and started first on a bucket brigade, and then searched, alongside other firefighters, for missing persons. Hours after he and some men had unearthed a fire engine, they tested its stability, and a Secret Service agent ordered him to help the next man who came through up onto the platform. "You do what you're told when the Secret Service talks," he says. That's how he found himself offering his arm to President Bush, who joined him on the truck and who insisted that Beckwith stay put rather than climb down as he had been told to do by the Secret Service agent. The Time magazine cover with that image now hangs, enlarged and framed, in his den. "All these guys that come over to interview me, they all have to have a picture of it," he says. He also has a first-edition print of the cover, encased in a display with a flag that waved at Ground Zero, given to him by President Bush. He's committed to have the items go to the 9/11 Memorial after he passes on. He has already donated his helmet and the clothes he was wearing that day. 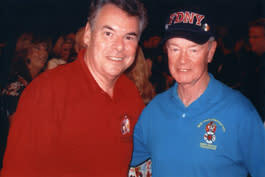 Since 9/11, Beckwith has become comfortable as a public speaker, often working on the behalf of the New York Firefighters Burn Center Foundation. He has traveled the world, visited with former President Bush 11 times (attending several White House parties), and become at ease with media interviews. He's seen much of the United States and has visited Germany and Ireland. It's a 180-degree turn from how he initially felt about the fame. After the photo made him a sensation, "I didn't want any part of it," he says. "When I get back to the block [on Long Island], people are coming out of their houses, and they're coming up to my driveway, and they're carrying candles," he recalls. At a diner that night, he saw himself on TV. Strangers began to approach him, asking if he was that man. Then came the phone calls. Beckwith remembers turning down Diane Sawyer, Rosie O'Donnell, the Today show. "'I'm nobody,'" he told them. "I didn't want any part of it; it's a bad time." Finally, a family friend pointed out to him, "If you don't get on these shows right now ... someone else is going to tell your story." He decided then and there to say yes when the next call came. His first appearance ("I was a nervous wreck!" he says) was on MSNBC. "I started to come out of my shell, I started meeting people and talking, and I'm glad," he says. Over the years, the Burn Center has received thousands in donations as a result of Beckwith's efforts, says executive director Gwen Curran. Instead of accepting speaking fees, she says, he asks for a donation to the Burn Center. Though his speaking tours weren't self-motivated, Beckwith says his desire to keep the story alive is what inspires him to continue. "'You're going to go and meet your maker, and your story will never be known,' I tell myself," he says. "It's a family history." Each year since the attacks, Beckwith has visited Point Lookout, a 9/11 memorial in Nassau County, Long Island, to reflect on that day. "I didn't want to go down [to Ground Zero], because I didn't lose just anybody – I lost friends," he says. He saw the memorial when he donated his helmet and clothing, but only from 20 stories above . "They're doing a nice job. I've seen what's happening, and I want to see the finished product, too," he says. While he isn't interested in pondering what life might have looked like without 9/11, his wife, Barbara, is happy to talk. "We don't do much baby-sitting [anymore]," she says. "We've just been working with the Burn Center, making visits at [the hospitals], we've been halfway around the world and done things we wouldn't have been doing." "He didn't just curl up and become a retired old man, so it keeps us young and keeps us moving," she says. After the 10th anniversary of the tragedy, she says, the demand for appearances will probably lessen. "They'll never forget, as they say, but they have to get on with it a little. Hopefully that will happen."